Sadly on Tuesday the SMART services of one of my hard drives started to spit out doom and gloom. You know the type of messages, failure, data loss, magic smoke, back up now, etc..
Well that sucked, so I went and ordered a new drive from ascent at about 10pm Tuesday. Now come lunchtime Thursday, I drop home between shifts to find a courier card (I always miss them). So after a quick trip down town I now have a box with my end drive in it, so that’s great. Probably work on it tomorrow. Once the new one is in and taken over all the functions of the old one, it will be time to pull the old one. I don’t actually think it’s that old, so I’ll have to check the purchase date, and if it is still under warranty, grab a copy of all the SMART errors, and send it back. Guess Friday evening will be a little more busy than I had first planned. Earlier we were doing a little roleplaying (GURPS). Now we’re eating pizza while watching an old Blondie DVD, maybe more music, or maybe more roleplaying afterwards. Can’t stay up all night, work tomorrow. It’s Tuesday, lovely and sunny, so why am I posting under sad? Well last week, actually 2.15pm, last Tuesday (give or take a few minutes) I injured my hand. Nothing to major. The wind was terrible last Tuesday. I was aware of this when I got to depot, so I was holding on to the van door strongly when I opened it. Guess not strong enough, as the wind ripped it out of my hand, giving my hand a good yank at the same time. Fifteen minutes latter it still hurt, so I filled out all the work place injury forms as procedure. After all if I came back with a sore wrist the next day and said I hurt myself at work yesterday, nobody will believe you, so just in case, always follow procedure, report and fill out injury forms when it happens. Well it wasn’t as minor as I was hoping. Next two days hurt all the time. By Friday it was only hurting when in use and for a while afterwards. Naturally driving means it was in use a lot. Pretty much did nothing with my wrist during the weekend, so come Monday when it still hurt after 30 minutes of driving, decided, six days now, not gone. See a doc. Well I saw my doctor this afternoon. Pretty much what I expected, painkillers and anti-inflammatories for a couple of weeks. Don’t worry about me, doesn’t hurt much, guess I just like to feel sorry for myself every now and then. It’ll be gone in a few weeks. Man, it’s really cold this morning. Technically the last day of summer was last Friday, and it rained all day, but this morning is ridiculously cold for this time of year. 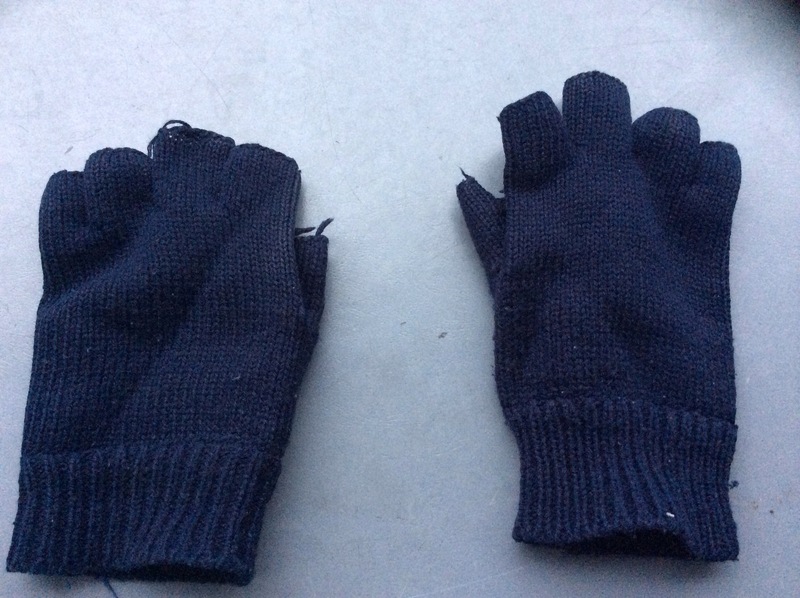 I even had to go put my gloves on this morning to drive the bus. Do you know hard it is to take a picture of you’re own gloves with a iPad? Pretty easy actually, but try taking one of you wearing them gets a lot harder. I finally gave up and took them off for the photo. Actually I’ve had them off a lot since the beginning of this article. I typed everything before the photo yesterday. I figured a little latter I’d take and add a photo. Well now it’s the next day, it’s cold again, and I have finally taken the photo, so now this post gets classified as both sad because it’s cold, and lazy as it took so long to complete.